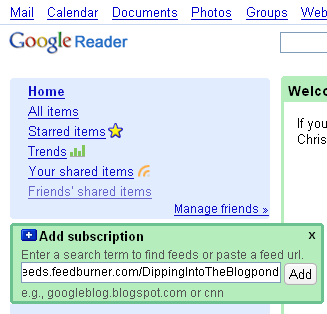 There are a few different ways to add new feed subscriptions to Google Reader. 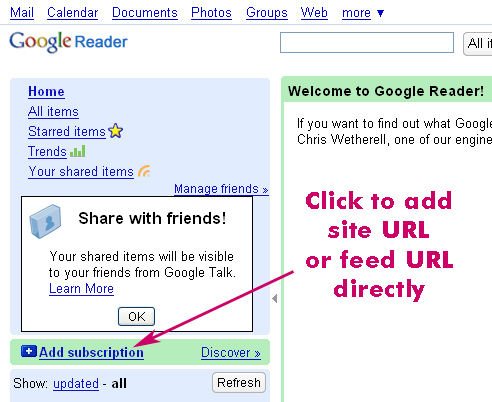 (Note: This is a follow up to How to Set up Google Reader, which you may wish to look at first if you don’t already have a Google account). 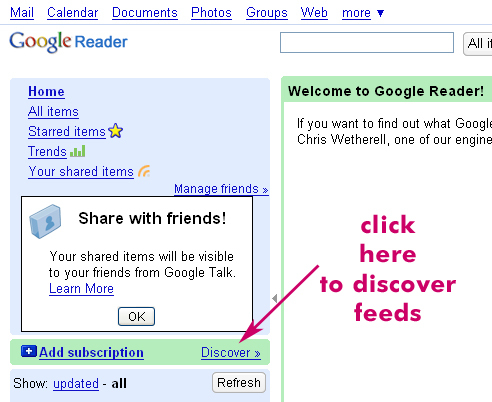 The first few are within the Google Reader interface. 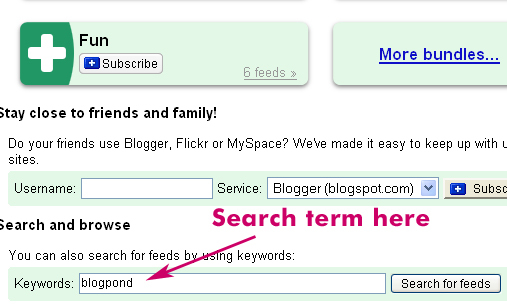 Look for the Icon on the left hand side that says “Add Subscription”. When you click on this you will get a box to add a website address. Or else you can enter the URL of the website’s feed if you know it (or if you have copied and pasted it from the site). NOTE: this is a very awkward way of adding subscriptions which I don’t typically use, but it IS an option. When you locate the correct feed, click the “subscribe” button. The latest posts (usually 10) will appear in your reader. I find the easiest way to subscribe to feeds is when I’m actually on the website that I want to subscribe to. 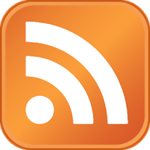 A vast majority of blogs will have an RSS Icon. There are varied formats but usually they look something like this. Alternatively, you can usually subscribe to a website from your browser (if you can’t locate the “subscribe” button on the website). Then make sure the following boxes are UNTICKED (note in my screenshot one is still ticked). I was not able to locate any browser options for subscribing on Internet Explorer 6. There you have it! Please feel free to leave any questions in the comments if there is something that isn’t clear. I use Bloglines. 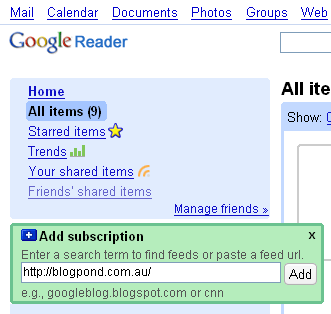 Is google reader a better platform? Kelley’s last blog post..Update on sleep and apologies. Bettina’s last blog post..Grumble grumble……. damn telemarketers! LOL – well hopefully it might be timely for someone. Am I a bit slow that I’ve NEVER noticed you can subscribe to a page from the URL field in Firefox until you pointed it out? Thanks for that outline, Meg. I had already set it up but had never used the discover function before. That´s pretty useful. I have found using IE7 that when I click the rss button it takes me to a microsoft page where you click subscribe to feed and then they go into the rss folders in Outlook. I don´t mind it because they are separated out from emails but I can just open one program and get everything. The feeds are also all listed near the favourites tab. I only switched over to Google Reader recently so I could access the feeds from any computer. I can´t work out a way to tell IE7 to subscribe to the feed in reader, so I have been using Firefox more and more. lol I`m sure it will Meg. I thought you did a good job of putting the “how to” together by the way. I like Google Reader. My only frustration is that on my laptop, the list of subscribed blogs window only scrolls down a third of the way through my list. No idea why that would be. Any ideas. Everything else is hunky dory. Google reader is pretty cool! Amongst it’s mass of features and filters there is also a bookmarklet you can drag to the toolbar which makes it super easy to subscribe to feeds. I think it’s under settings > goodies and look in the last paragraph. Burgo – It’s handy if you’re having trouble locating a subscribe button, that’s for sure. Guera – Yay! I found the solution and have updated the post to show how Many thanks for pointing that out. Colin – could it be browser related? What are you using? Other thought is that if you make folders & sort your feeds that way, perhaps it might display the (now) shorter lists. You can collapse and expand folders. Rod – that is a very hand tip, thanks. I couldn’t get it working in IE, but it does work well in Firefox. How do I set up a feed from my site. I had one set up, but I can’t find again how to go back and modify it as my site name has changed? 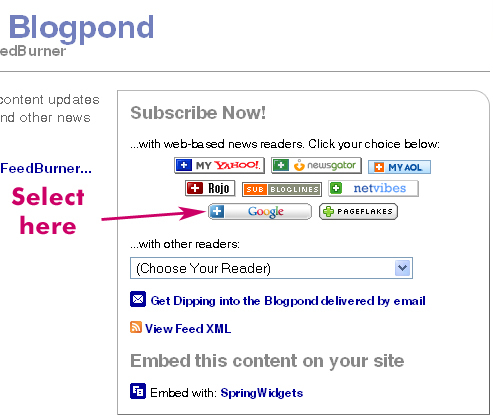 Just follow the instructions at Feedburner (I’m hoping this works if you don’t have a site feed). If not, let me know.